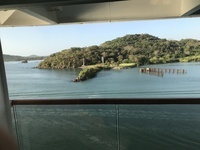 We chose this cruise because my husband wanted to sail through the Panama Canal and we had experienced an amazing transPacific cruise on the Holland America Noordam in 2018. This was a type of journeyman cruise compared to that on a smaller, older ship with fewer passengers, amenities and activities. The shop’s air conditioning was faulty with many of the public areas kept at painfully cold temperatures. I talked to the cruise director about reading of this issue on earlier Volendam cruises and he admitted the frigid air conditioning was an ongoing problem which they had not resolved. There was also, perhaps not coincidentally a ship wide respiratory infection. The crouping, coughing etc. must have affected half the passengers. Everyone had the Volendam virus. My husband and i both came down with it and are still affected more than two weeks after disembarking. The good: the meals in the dining room and Lido were very good. The EXC tour director, Jude, was excellent and entertaining. The Adagio violinist and pianist were excellent as was the pianist at the Ocean Bar. The rest of the entertainment was mediocre. The crew were friendly and helpful. But the boat is so in need of updating and repair. The ports were fine but most everyone was interestedin the canal experience which was remarkable. Gatun Lake was beautiful. Cartegena was impressive. We liked Huatalco and the city of Antigua in Guatemala. 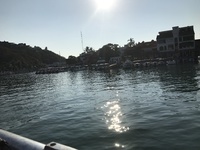 The port of Corinto Nicaragua was not good. Costa Rica was interesting and we enjoyed the combination aerial tram and river rafting tour. The commentator thriugh the canal was excellent. We chose this cruise because my husband wanted to sail through the Panama Canal and we had experienced an amazing transPacific cruise on the Holland America Noordam in 2018. This was a type of journeyman cruise compared to that on a smaller, older ship with fewer passengers, amenities and activities. The shop’s air conditioning was faulty with many of the public areas kept at painfully cold temperatures. I talked to the cruise director about reading of this issue on earlier Volendam cruises and he admitted the frigid air conditioning was an ongoing problem which they had not resolved. There was also, perhaps not coincidentally a ship wide respiratory infection. The crouping, coughing etc. must have affected half the passengers. Everyone had the Volendam virus. My husband and i both came down with it and are still affected more than two weeks after disembarking. The good: the meals in the dining room and Lido were very good. The EXC tour director, Jude, was excellent and entertaining. The Adagio violinist and pianist were excellent as was the pianist at the Ocean Bar. The rest of the entertainment was mediocre. The crew were friendly and helpful. But the boat is so in need of updating and repair. The ports were fine but most everyone was interestedin the canal experience which was remarkable. Gatun Lake was beautiful. Cartegena was impressive. We liked Huatalco and the city of Antigua in Guatemala. The port of Corinto Nicaragua was not good. Costa Rica was interesting and we enjoyed the combination aerial tram and river rafting tour. The commentator thriugh the canal was excellent.